We received an email from a chowtimes reader (Eric) who asked us if there is a better way to look for restaurants on the site. 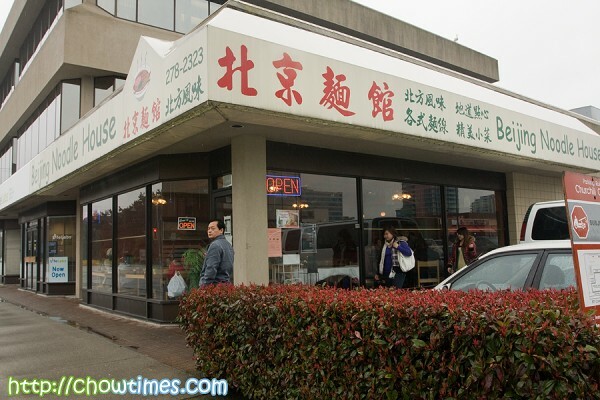 In particular, Eric was asking if he could look for, say, all Chinese restaurants in Burnaby. Yes, you can … to a great extend. I can understand Eric’s needs. 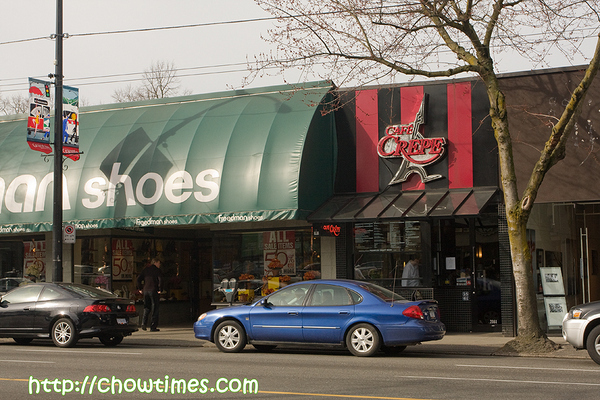 Chowtimes had grown over the years with a large throve of information. Getting to what you want is not always easy. We always had on the sidebar a listing of categories by cuisine. Over the many years, we had amassed quite a lot of restaurant reviews (almost 400 now). Some of the categories were too large. We wished we had the time to go back and revamp the categories but that would involve way too much work. The above is hierarchical view by categories. As a short term solution, Suanne and I had spent a couple of days and categorized all restaurant reviews by the cities in Metro Vancouver. 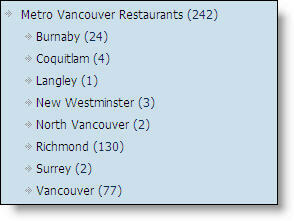 We are categorizing only Metro Vancouver because most of our restaurant review readers are from Vancouver. That list above may help a little. But what I wanted to point out to you is our Tag Cloud. Corporal Nanzaro had been a member of the Royal Canadian Air Cadet for two years now. He enjoys the activities and signs up for almost every event organized. 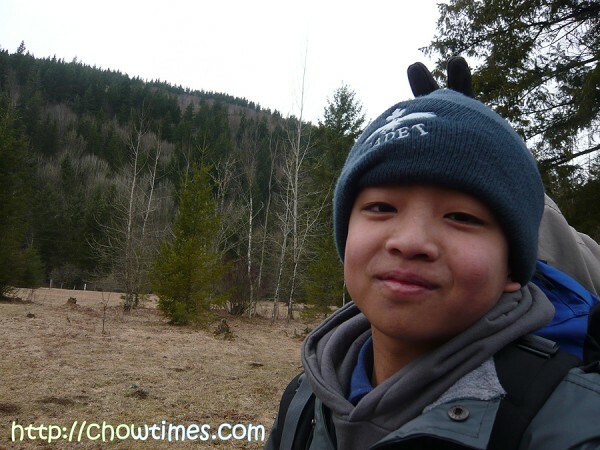 Just a few weeks ago he went to a spring survival camp called Spring Thaw in Golden Ears. I won’t even think about signing up for a camp where the day high temperature is zero degree Celsius … but he did … and he enjoyed it a lot. He brought back some of the rations that he had left over from the camp. 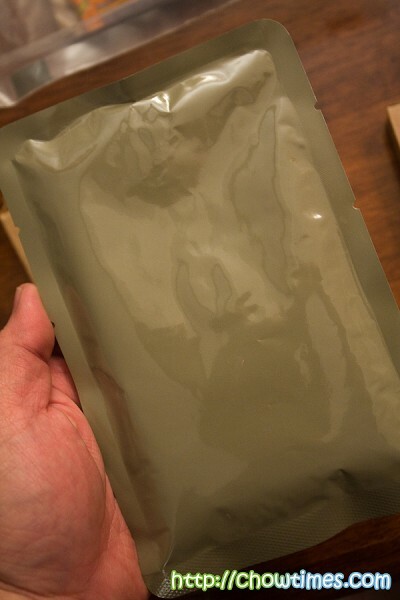 So here it is … our blog about MRE’s. Canadian Forces calls their rations IMPs which stands for Individual Meal Packs. 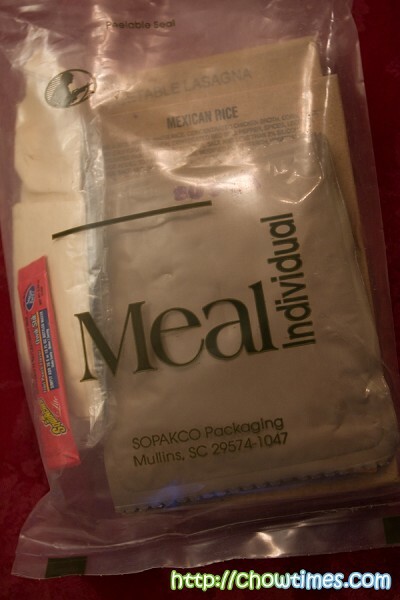 The US Military calls theirs MRE’s (Meals, Ready-to-Eat). The ones that Nanzaro had at the camp are the US Military version because they ran out of the Canadian Forces IMPs. 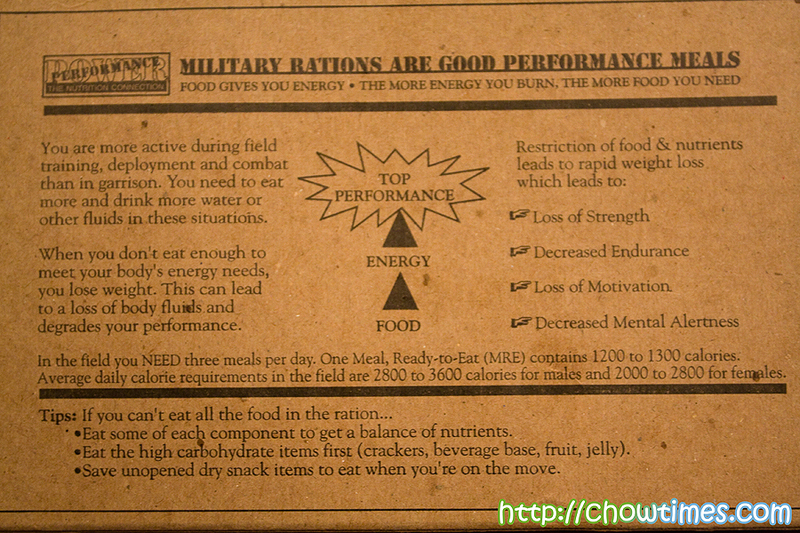 The MREs are designed to feed an army personnel in battle or field conditions. Each day pack consisting of breakfast, lunch and dinner contains 3600 calories, sufficient for the energy needs of a soldier in active combat. The food are packaged into cardboard boxes. 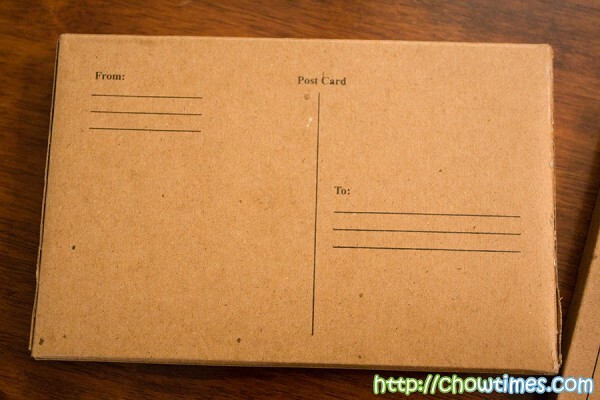 On the flip side of the cardboard box, they can even double up as a post card. I wonder how many soldiers actually make use of this. In each of the boxes are lightweight pouches. 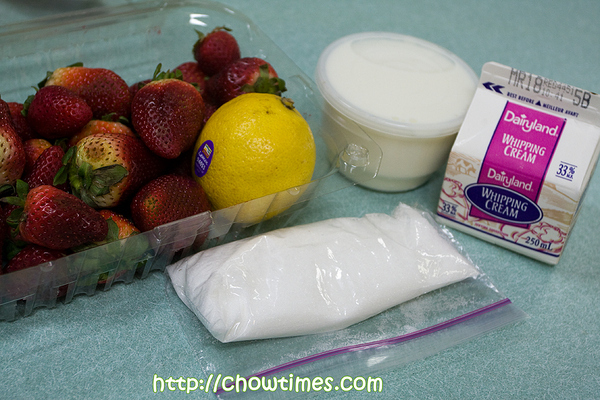 Normally, the boxes are discarded and it’s these tough pouches that are carried in backpacks. These pouches are designed to be resistant to punctures. These are good for at least one year. 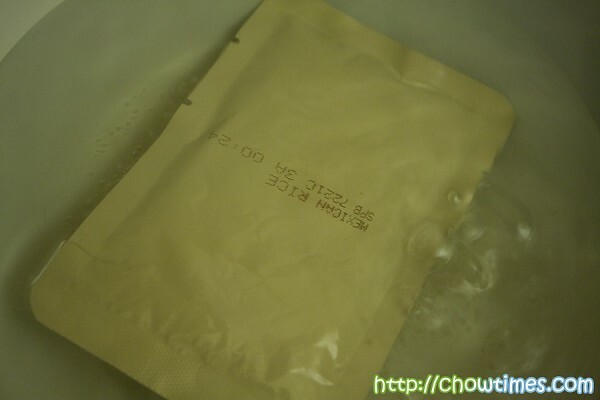 While the MREs may be eaten by itself, the proper way is to boil them so that it becomes a hot meal. There were many types of Entrees. 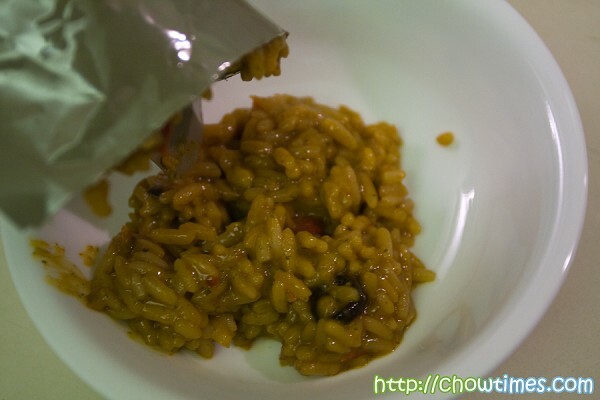 The Mexican Rice was not too bad really — close to being good actually! We tried it and actually finished them. Arkensen said that it does not taste as good at home but remember that they were great during camps. I guess when you’re hungry anything tastes good. We also tried the Lagsana Pasta too. This restaurant has been closed according to Urbanspoon – updated 16th April 2010. All I can say is … “Oh wow”. You really should check this place out. Suanne and I get quite a number of recommendations from our readers. We like these recommendations as they are often little known restaurants with a lot of character to them. Eric, who we do not know personally, sent us a note raving about the Northern Chinese restaurant find that he had been going to for the past while. 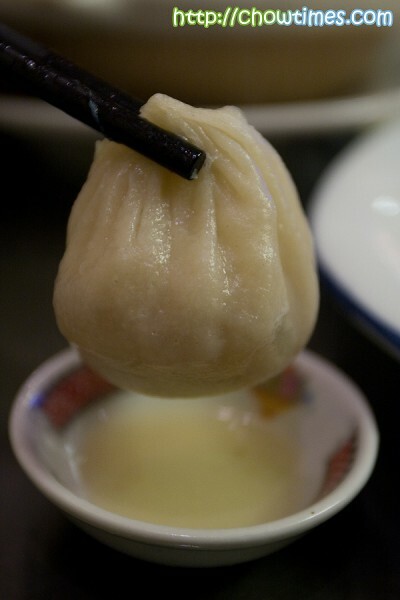 Specifically he pointed out that their specialty is Soup Dumplings (Xiao Long Bao) … MSG-free Xiao Long Bao. Suanne and I decided to take that drive to Popular Chinese Cuisine Restaurant. 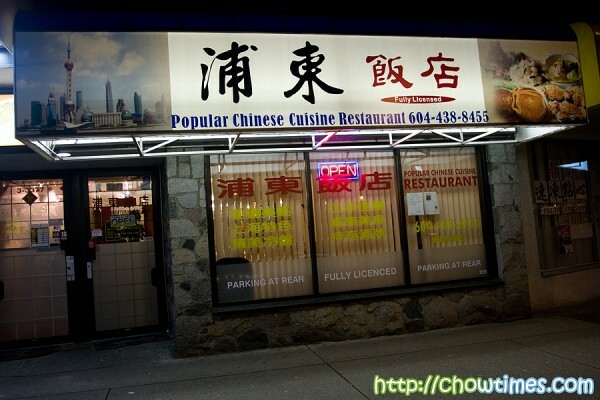 Popular is located on the north side of Kingsway between Joyce and Tyne. From the outside, we thought that this is probably the last eatery we will try in the row of restaurants which included the Congee Noodle King. The blinds were drawn which does make people who walk past not really care what to check. Eric described this place as a hole-in-the-wall family owned restaurant. While it is definitely family owned, it does not conjure images of small dark restaurants. 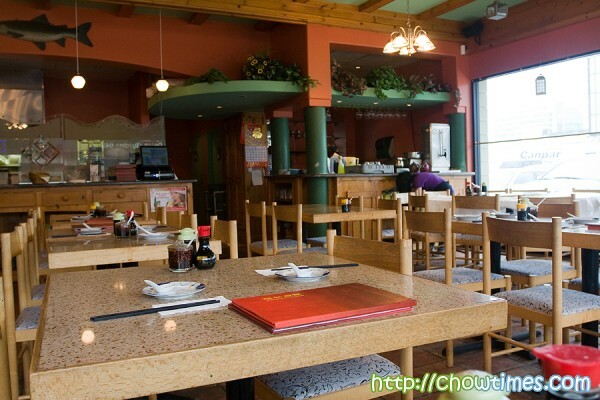 As a matter of fact, the restaurant is bright, clean and spacious. However, it is a very quite restaurant with ours the only other table taken that evening. Popular is run by a husband and wife team. They were friendly and helpful but the thing is that they speak only Mandarin. We managed despite the language problem. Instead of choosing our own dish, we asked them for the favourite dish of their customers. Of course we had to order the Xiao Long Bao. They came in a steamer with individual dumplings placed in mini saucers. I thought it was a neat idea having never seen this before. 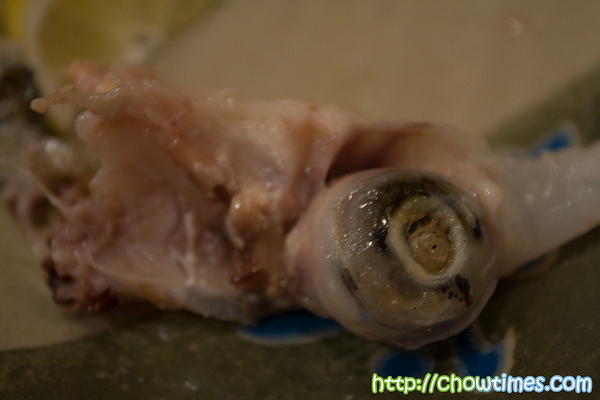 One thing that struck me was how thin the dough skin was and yet being able to hold in the gelatin soup. I guess the reason why they serve this in mini saucers was because of the thinness of the almost translucent skin. 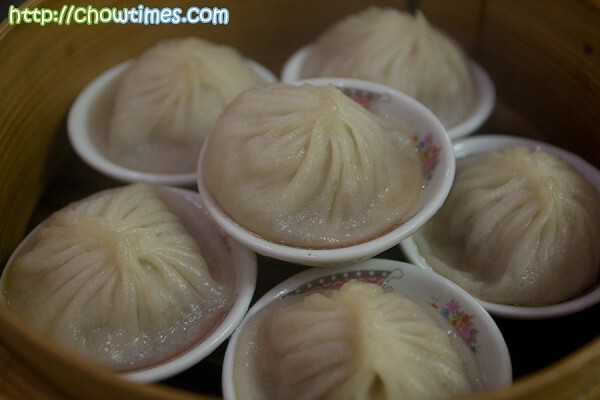 Suanne told me she saw on TV how the delicate Xiao Long Bao is to eaten. You need a soup spoon to hold it. You first bite off a corner at the thinner side and then carefully sip the scalding soup before you eat the rest of it. Their Xiao Long Bao was great. They reminded us that they are MSG free. Six dumplings for $4. Not bad I thought. Before the meal came, they even gave us some free pickles and stuff. 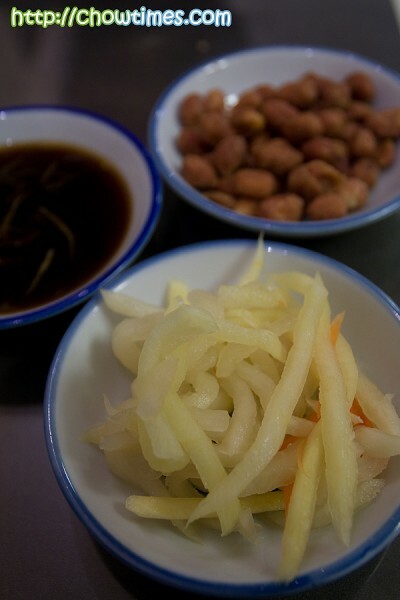 The one in the background is some pickled vegetable … carrot with daikon I think. The peanuts were particularly good and was wondering where they got that from. 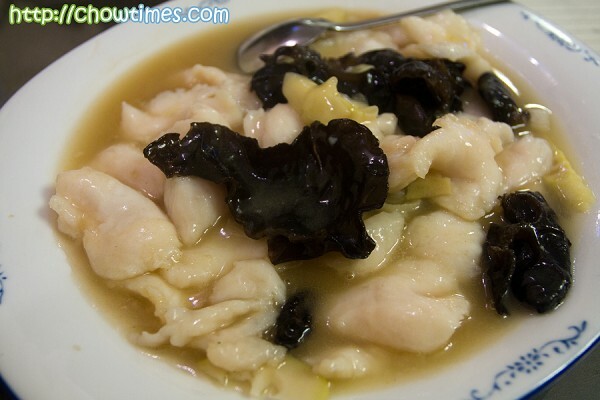 The Sliced Fish with Wine Sauce was great too. We were surprised how big a plate this came in. This one dish was definitely more than enough for two people. 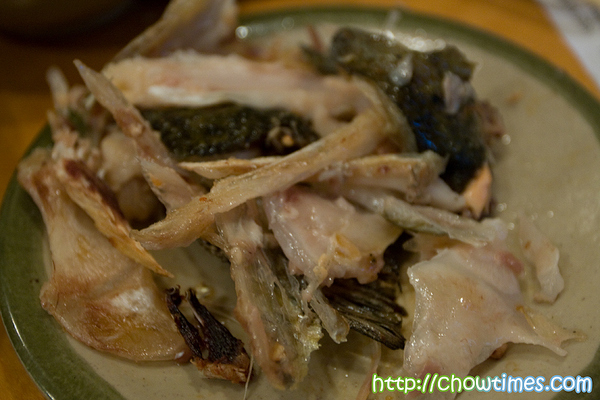 Served steaming hot, it has a very nice rice wine fragrance to it. Updated: 17th Dec 2014; This restaurant is closed according to Urbanspoon.com. It was one of those days that Polly and I cant decide where to go for our cake meet. The outstanding list of places to visit does not appeal to Polly. So, she suggested to go back to Sweet Obsession on West 16th Vancouver as it’s one of the better cake places in town. 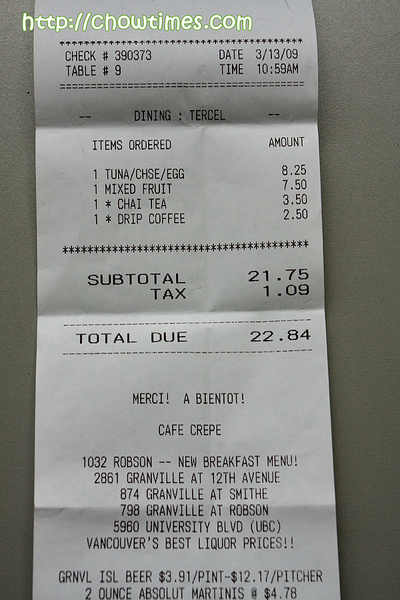 While driving along Granville St, we remembered that we has always wanted to visit Cafe Crepe on Granville at 12th Avenue. So, we changed our plan to go to Cafe Crepe. There are plenty street parking along Granville St. Cafe Crepe is pretty easy to find with it’s striking red and black awning. It was pretty quiet as it’s still very early in the morning, just before 10am. After we were seated and placed our orders, I took out my camera and took some shots our drinks and crepe. Just after I took a shot of the first crepe, a gentleman (not sure if he is the owner or one of the staff ) approached me and told me that it’s the company policy not allowing photography in the cafe. I respect his request and did not take any more photographs. So, here I am, trying to describe the food we had without a photograph. I find it a bit hard as pictures are the heart of chowtimes and pictures speak louder than words. The above was what we ordered. Polly had the Chai Latte. My regular coffee came in a very small cup, like those use for espresso. Luckily, the coffee has free refills. We ordered a savory and a sweet crepe to share. I remembered I read about a review on Cafe Crepe by Doesnt Tazte Like Chicken who gave a thumbs up for their Tuna crepe. So, we went for the Tuna, Swiss Cheese, Egg and Mayonnaise Crepe. It was indeed pretty good. I’m kind of puzzled by the fact that Christina of Does’nt Tazte Like Chicken was able to take pictures of her food in the same franchise store. Don’t they have the same policy? The sweet crepe we ordered was Mixed Fresh Cut Fruit with Apple Sauce and Cinnamon. It was after a few bites that Polly noticed that there was a strand of hair in the crepe. The waitress apologized for the unwanted hair and replaced the crepe with a fresh one. Hmm, that was not a pleasant experience for us. Anyway, the Mixed Fresh Cut Fruit crepe was just so, so; dominate by apple sauce. Next time, we’ll go for the more conventional chocolate and banana crepe. On the day we made the Taro Cake in the South Arm Community Kitchen, it was an exceptional cold spring day with temperature as low as -5 degrees Celsius on the day low. Guess what, Lorna was demonstrating how to make Fruit Ice-Cream on that day. It is certainly a very cold treat for a very cold day. Lorna brought some ice-cream which she made earlier for us to try. 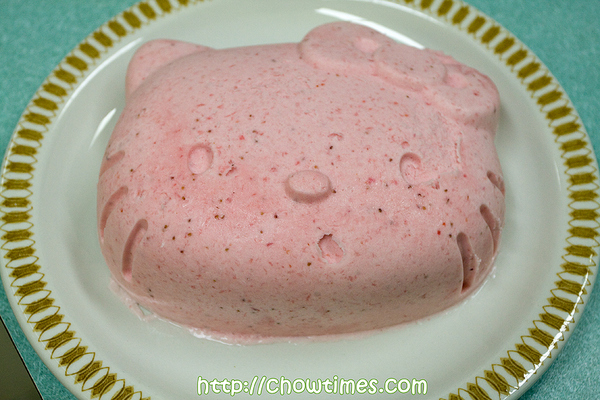 Look at this cute hello kitty strawberry ice-cream. It’s not only pleasant to the eyes, but it is creamy and taste wonderful. Many of members were asking Lorna on the cost of the ice cream maker and I think this demonstration has inspire some of the members to have the desire to get an ice-cream machine this summer, that includes me. Back to the South Arm Community Kitchen, Peggy demonstrated to us how to make Taro Cake. 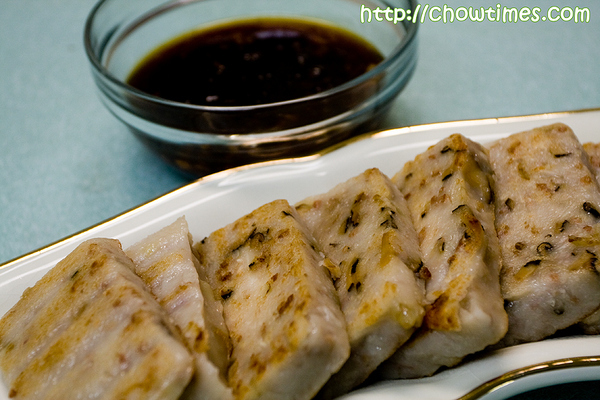 Taro Cake is a common dim sum item. 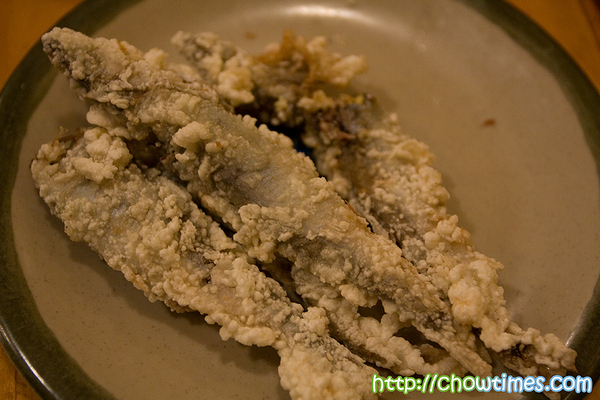 It can be eaten fresh from the steamer or lightly pan fry to give it a crispy outer layer. 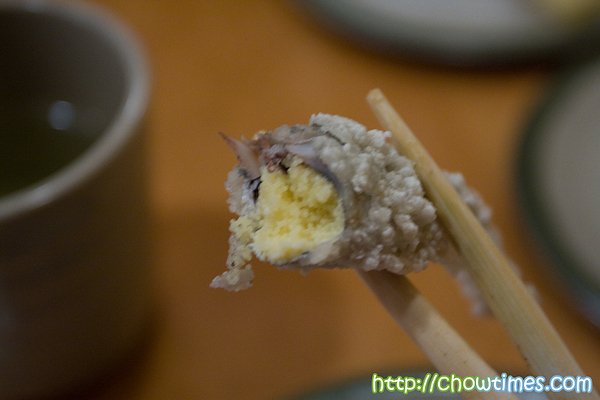 The Taro Cake can be eaten as a snack or even as a meal. Peggy made two loaves of Taro Cake in the kitchen. She also brought one which she made earlier as the cake needs to be cooled down before you can slice it up into pieces for frying. The Taro Cake is so good that the group finish all the three loaves of Taro Cake. Peggy’s Taro Cake is filled with pork and mushroom. 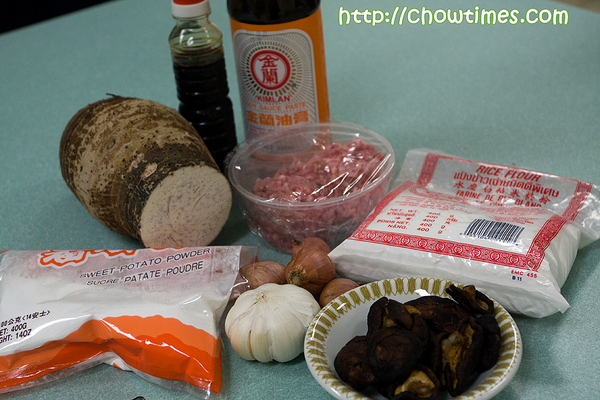 However, you can substitute the filings with dried shrimp and Chinese sausage which are more commonly found in Dim Sum places. For dessert, Christina, Paul and Lorna made this Easy Chocolate Pudding for the South Arm Cooking Club for Seniors pizza mania meet. Apparently, Paul is a fan of chocolate. 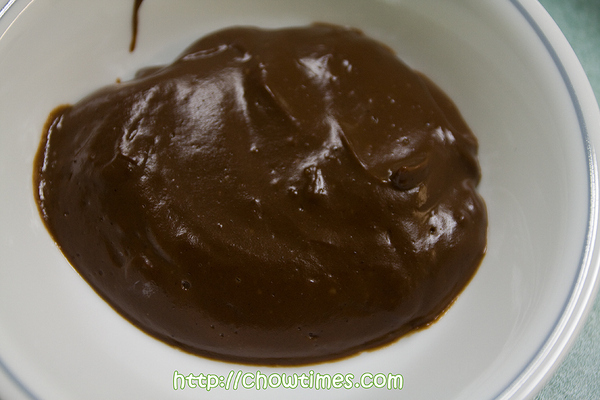 This Easy Chocolate Pudding is made specifically for Paul. This Easy Chocolate Pudding recipe is adapted from John Scharffenberger. This recipe serves 6. 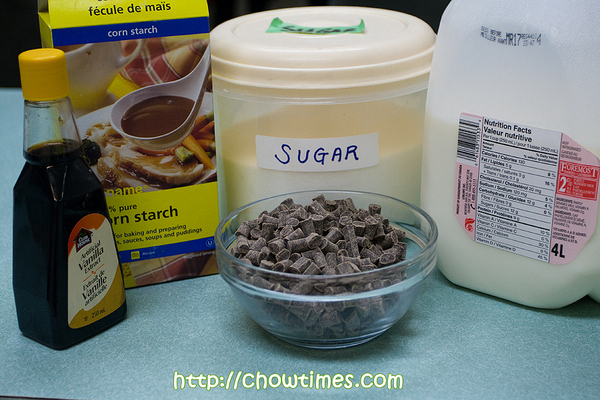 The chocolate pudding is not overly sweet and I’m sure kids will love this. This makes a great dessert for any chocolate lover. Tuscan kale is sweeter and more tender than regular kale. Tuscan kale also goes by the names black kale, lacinato kale, dinosaur kale and cavolo nero. Unlike lettuce, kale is a hearty green that does not wilt after dressing is added. The salad actually tastes better after a day or two in the fridge. So, it is a great salad that you can prepare in advance for a party. 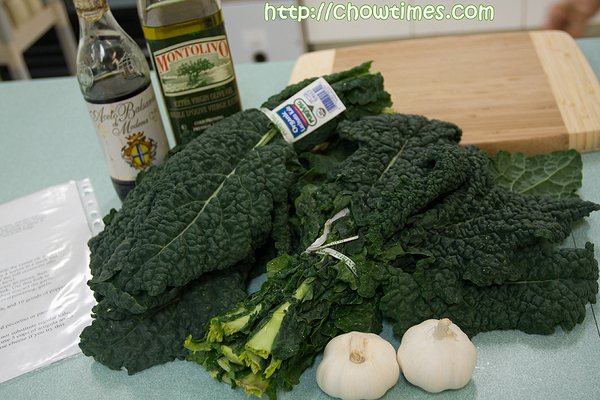 Hugh, June and Frank made this Tuscan Kale Salad as the side dish to accompany the pizzas. This recipe serves 4. For a richer salad, add 1/4 cup grated pecorino or parmesan cheese. If Tuscan kale is not available, do not substitute with regular kale, which will be too chewy. Instead, use 3 cups of arugula and 3 cups of baby spinach. Be sure to use cheese if you try this combination. There were three of us who went out looking for lunch a week ago. Nanzaro was away with the playing host to a group of cadets from PEI. 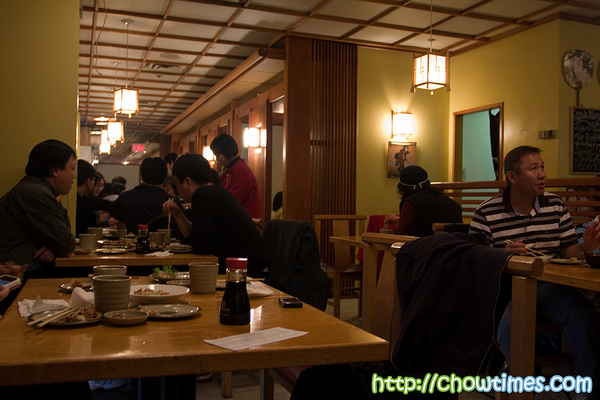 So we went to somewhere near home … just to grab a bite and then get home quickly to work on chowtimes. I had been doing a lot of tweaking on the blog lately and I just wanted to plonk myself down getting it over with. The blog is getting too big and each time I make a change, it takes so long to do impact analysis and testing before I actually execute the change. This is beginning to feel like a full time job already! And am enjoying every minute of it. We went to the Beijing Noodle House which is located on Buswell (at the intersection of Cook) in Richmond. I feel that the Beijing Noodle House is not as well known as the many good Chinese restaurants in Richmond. It is because of it’s location behind the busier No 3 Road. There are no cluster of restaurants here and is surrounded mainly by apartments and business offices. There is a plus point for this … parking is abundant here. 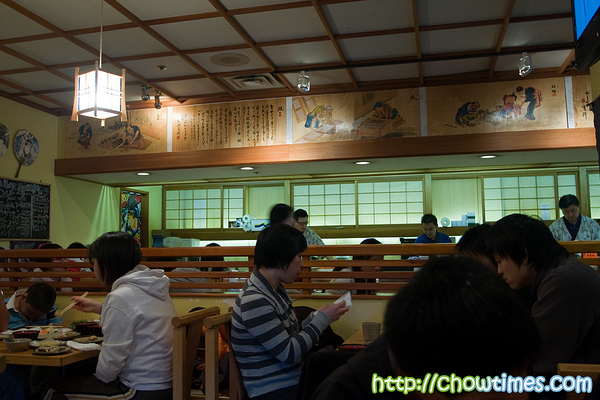 We like this kind of restaurants … it is enclosed with glass walls throughout. We want to see how it is inside. 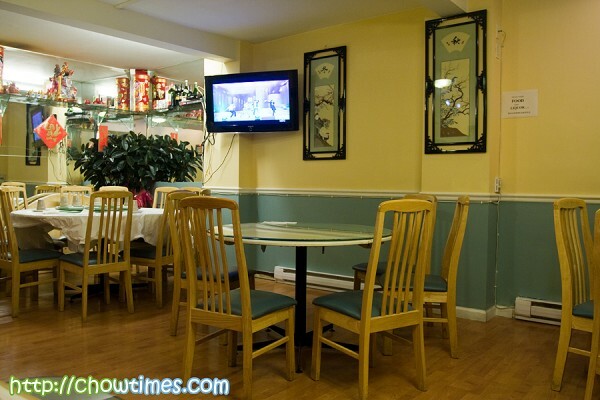 The Beijing Noodle House serves authentic Northern Chinese dishes. The chef, who came up to greet the customers, speaks authentic Mandarin … you know, the unique melodious official sounding kind of Mandarin. Their customers seems to be mainly Mainland Chinese customers which perhaps enforces the perception of the authenticity of this restaurant. For a place this this, they had obviously put in effort in creating a nice hard cover menu — one that you only see in more established restaurants. 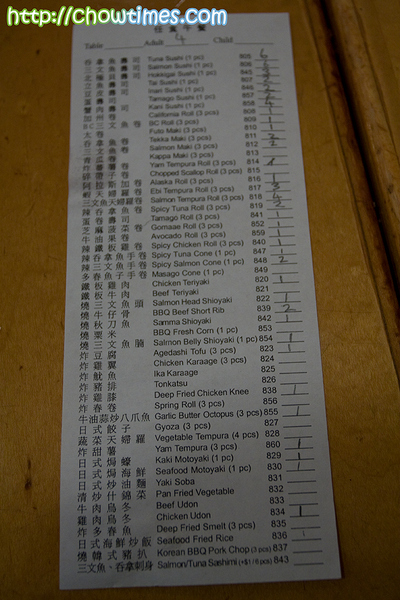 Even the take out menu was printed in high quality glossy paper. Service was good and helpful. They helped us with the selection. 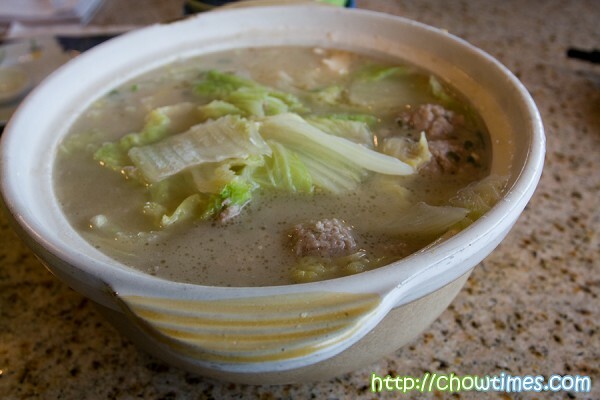 Seeing that it was a wet and cold day, they suggested the Meatball, Vegetable Vermicelli in Soup. It was an excellent idea as we always love soup with rice. They had over a dozen choices of soup on their menu ranging from $5 to $12. Updated: 17th Feb 2011: This restaurant had changed its name to Ebi Sushi Japanese Restaurant, the name had been changed unknowing to us. Each time we go for AYCE (all-you-can-eat) we end up regretting over eating. However, this time we cannot say no because the birthday boy (Arkensen) gets the choice. Nanzaro was, without doubt, very happy with the choice. We decided to go to E-Bei for the AYCE. We had heard of some bad reviews of E-Bei on many sites before but decided to go nevertheless. It is because I know our boys are not food snobs and will definitely enjoy E-Bei — and they did. 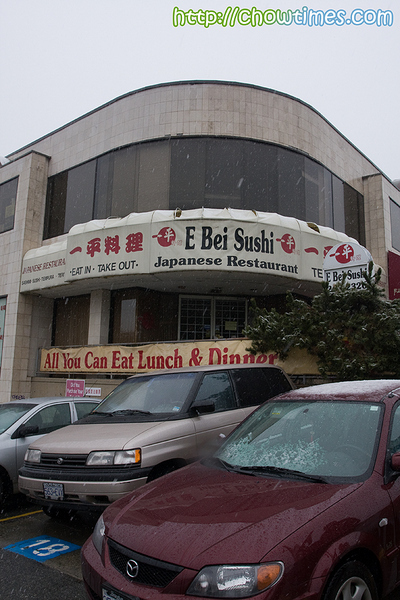 E-Bei is located at the intersection of 41st and Granville in Vancouver. One thing we did not like about dining here is that we had to pay for parking … $4 for two hours. E-Bei is not very big as far as AYCE Sushi places are concern. I am comparing the size of this place with places we had been to before like Fish On Rice and Kingsway Sushi. E-Bei was packed when we were there and there was quite a bit of a wait line too. So, there you go … sometimes one cannot just rely solely on anonymous reviews. People does obviously enjoy E-Bei and find this place of good value here. However, seating is tight … so tight that we could see and smell the food of our neighbor. To us, this place is more Chinese than Japanese. From the looks of the customers and workers, I can see Chinese faces. Can you tell facial features of Chinese from Japanese? I can … I think. Orders are placed with the chit they provide. I like that they always have a fresh one for us the moment they take away our order — no delaying tactics like some places who has every trick in the book to make you wait. The food came very fast and quite accurately too. 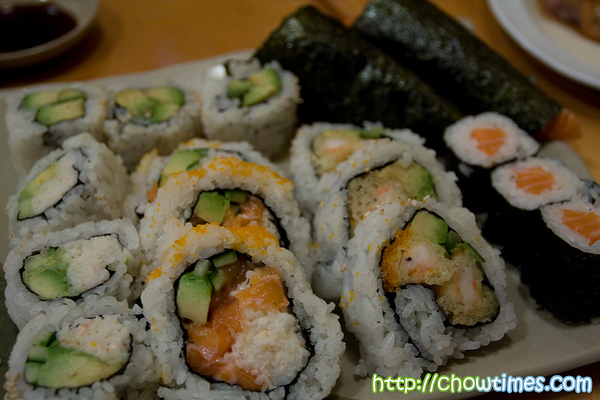 We find that they have more choices as compared to our recent visit to Kingsway Sushi. The AYCE costs $11 ($9 for children). On weekends and holidays, they charge $1 extra. However, they stipulated a time limit of 1.5 hours but I don’t see any signs of this being enforced. I think it’s just a provision for people who eat excessively. The Nigiri’s are pretty good. I think this is the favourite of E-Bei’s customer. This is because the menu states that they will charge 50 cents for each unconsumed rice of any Nigiri Sushi. 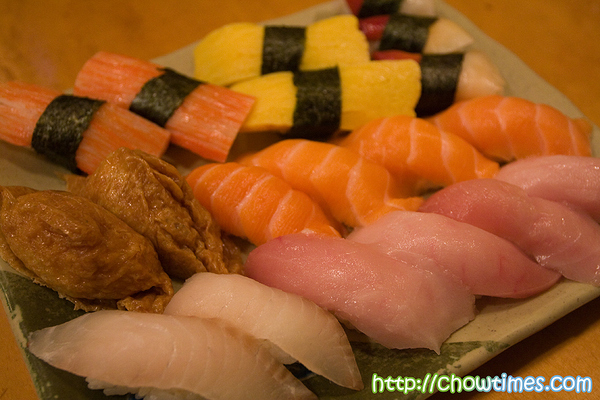 I guess some people ordered tons of this, removed the rice and had the fish as sashimi. LOL! Their Nigiri is respectable in that they did not load up the Nigiri with lots of rice … it was much more raw fish than rice. 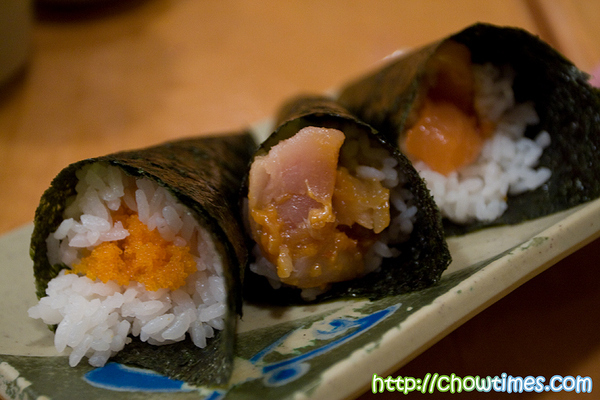 The cones (roe, spicy tuna and spicy salmon) were quite good … except that the rice was like Chinese steamed rice. Alright it might be a no-no to some people but it is more than edible. Like I said, it was quite good … for us. The rolls were some of the ugliest and malformed rolls we had ever seen. It does not look pretty but it was OK. The bad thing here is with the color green in almost all of it. You see, our boys will refuse to touch it if it has any green color stuff (avacado or cucumber). Suanne and I ended up eating all of these. Suanne likes the Salmon Head a lot. She is so adept in picking off the flesh. 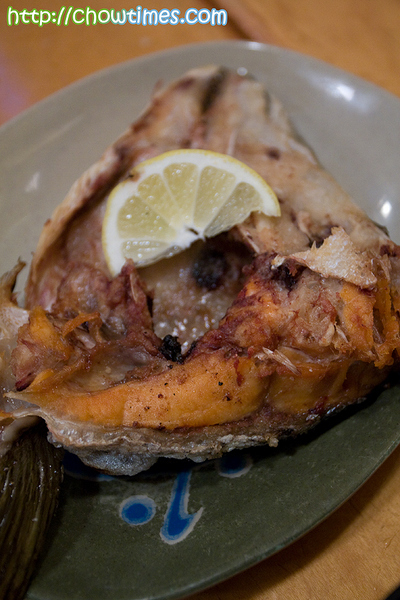 I find that their Salmon Head looks the best among all AYCE’s — big chunky pieces and fleshy. … eyeballs! I know some people likes it. We like smelt with roes in it. We guess it is very cheap because we find these in many eating places. 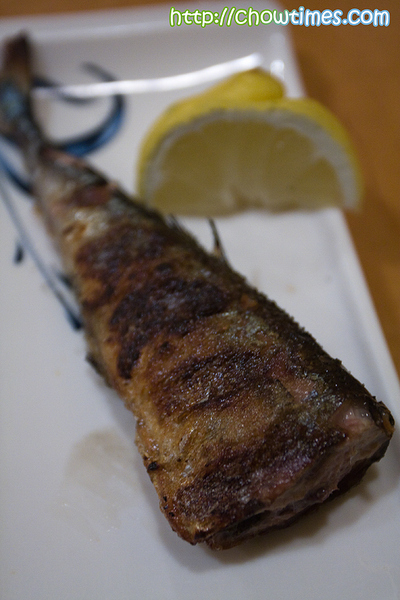 For some reason, we had never come across smelts with roe fresh from the supermarkets. We can’t find it in Asian markets or even at places in T&T. Do you know where we could get some? 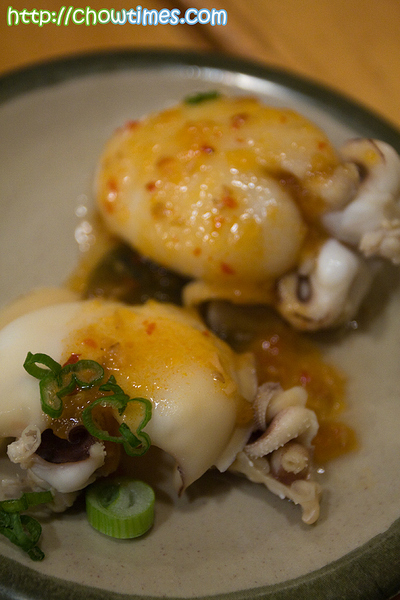 The Octopus was served with garlic butter sauce, or so says the menu. It looked good but was somewhat too salty for our liking although we like the slight spiciness in it.